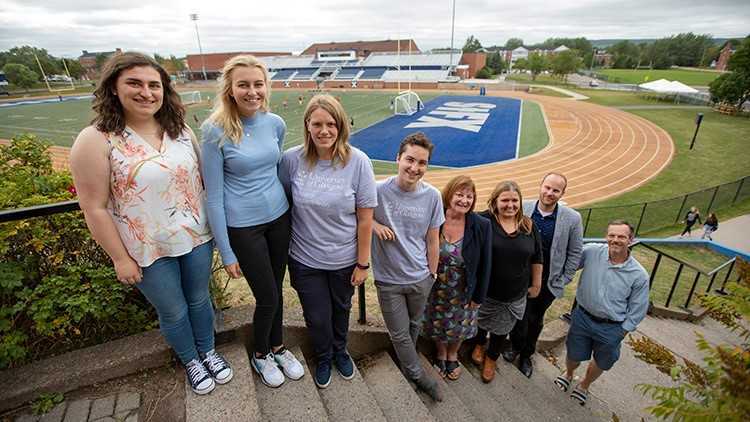 Pictured, top to bottom are, University of Glasgow – Dumfries Campus, School of Interdisciplinary Studies education students Erin Craighead and Jordan Rae, and health and social policy students Rebecca Stanley and Ruairi Turner, faculty Anne Ferguson, StFX Office of Internationalization Director Larissa Strong, Dr. Jeremy Law of the School of Interdisciplinary Studies, and StFX education professor Dr. Chris Gilham. A special group of guests from Scotland was on the StFX campus this week to talk about strengthening international partnerships. A delegation from the University of Glasgow – Dumfries Campus, School of Interdisciplinary Studies—including two faculty members and four students—was on campus to discuss potential activities for further partnerships, building on the relationship that exists with StFX’s Faculty of Education. StFX has an international practicum available to its B.Ed. students, who have been to Scotland twice. “Hopefully, we will set up an international student placement experience,” says Anne Ferguson of the University of Glasgow – Dumfries Campus, who says the two schools have had a good relationship since they first collaborated together through Skype in December 2015. “Student teacher placement, a student exchange program, staff and faculty mobility, we hope to try to build on that,” adds colleague Dr. Jeremy Law. Dr. Law says during StFX’s last visit to Scotland he recalls speaking with StFX education professor Dr. Chris Gilham and becoming fascinated with his mental health literacy research, including a partnership Dr. Gilham is involved in with teenmentalhealth.org in Halifax, NS. Dr. Law says they are now working on preparing a grant for the Nuffield Foundation to introduce mental health curriculum to schools in Scotland. As part of the visit, StFX placed the two visiting education students in local schools for two days and the two health and social policy students at the National Collaborating Centre for the Determinants of Health on campus for two days. As well, Dr. Gilham facilitated ‘Mental Health 101’ for the delegation. The group also spent a day in Halifax discussing mental health literary at teenmentalhealth.org. The students, who had to apply for the opportunity, say the experience has been terrific. “I’ve fallen in love with it, the scenery, the people who are so kind and friendly, they want us to have a good time,” says Mr. Turner, a student ambassador at his university. Ms. Stanley says the opportunity really appealed to her, particularly the mental health side of things as well as the opportunity to visit Canada, a country she always wanted to see. All four students say their placements were a valuable experience. Ms. Craighead and Ms. Rae spent one day each at Antigonish Education Centre and St. Andrew Junior School shadowing teachers, helping out during lessons, even meeting with a Gaelic teacher, and getting a review of what school is like in Canada. “It’s really interesting to see how much they knew about Scotland,” Ms. Rae said. Mr. Turner and Ms. Stanley enjoyed learning about the work the NCCDH does and seeing similarities and differences with Scotland. “As part of our internationalization efforts, we see this partnership as an important one that will benefit faculty, staff and students,” says Larissa Strong, StFX Director, Office of Internationalization.